Have you seen Les Miserables? 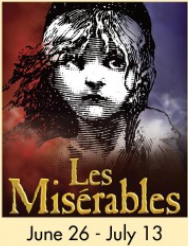 If you have not seen Les Mis at the Maine State Music Theater this month……you must! Many of us from the office have been to see it over the past week and all feel that it was probably the best performance we have seen to date at MSMT. The amount of talent on the stage was unbelievable and we highly recommend that you see it! Gregg Goodbrod gave such powerful and emotional performance playing Jean Valjean, that it brought many of us to tears. The range in his voice was amazing, especially when he sung “Bring Him Home”. Young Cosette was played by Sophie Calderwood, a local girl with loads of talent. She sang Castle on a Cloud flawlessly. Other fabulous performances include Curt Dale Clark as Javert, Heidi Kettenring as Fantine, Manna Nichols as Eponine, and Alec Shiman, another very talented young actor played Gavroche. I have seen a few shows on Broadway and some in Boston, but the best shows I have seen are right here in Brunswick, Maine at Maine State Music Theater. We are so lucky to have such an amazing Theater right around the corner that brings actors from all over the country and promotes young, local talent as well. Congratulations to the cast and crew of Les Miserables! Well done!